The new Pacemaker back at home. Sports was one of the biggest stories that The Daily Tar Heel covered in 2015-16 — from continued fallout of the athletic-academic scandal to the basketball team that was one Villanova basket away from the national championship. So it’s no surprise that the Pacemaker entries for the DTH under Editor-in-Chief Paige Ladisic were heavy on sports, including the hauntingly beautiful “Heartbroken” paper telling the story of that basketball season’s end. The hard work of the whole school year, including those crazy Final Four weeks, paid off when the DTH won its 13th Newspaper Pacemaker from the Associated Collegiate Press at a ceremony in Washington in October. Budget constraints kept the staff from attending the awards ceremony this year, but the @acpress Twitter handle get everyone updated. Ladisic said she was in the car waiting for her mom to have a doctor’s appointment, refreshing her Twitter and texting last year’s team. 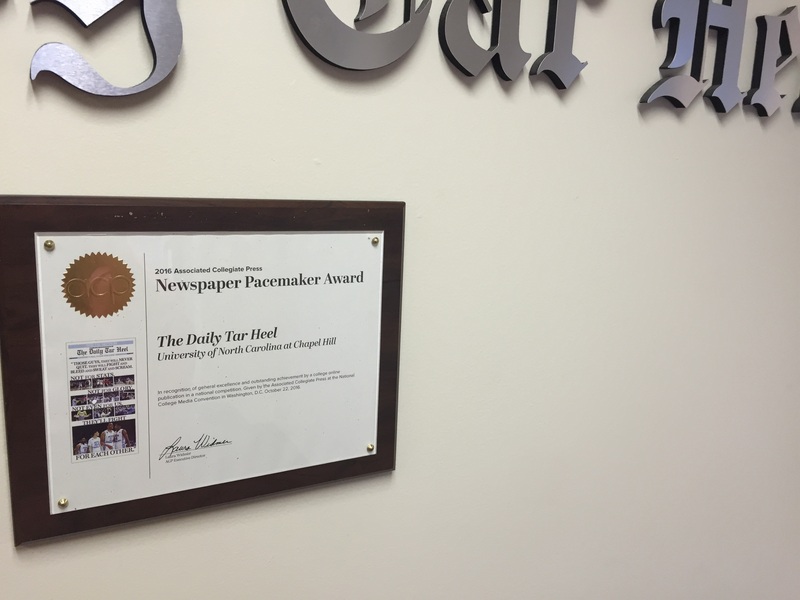 The other daily newspaper winners include The Duke Chronicle, The Daily Northwestern, The Daily Texan, The Oklahoma Daily, The Daily Orange, the Minnesota Daily, The Indiana Daily Student, The Daily 49er and The Daily Bruin. The staff of The Daily Tar Heel and sister publication Southern Neighbor magazine were recognized in the Associated Collegiate Press’ individual awards as well. José Valle won fifth place for Design of the Year, Special Section Cover, for the 2015 Welcome Back edition cover. Katie Williams won second place for Photo Excellence, Sports, for the previously mentioned basketball coverage. The Editorial Board won third place for Story of the Year, Editorial/Opinion, for an editorial on free speech. Zoe Schaver of Southern Neighbor won third place for Story of the Year, Diversity, for a story on farm foreclosure and 10th place, Story of the Year, Sports, for a story on the cost of youth sports. Aileen Ma of Southern Neighbor won fifth place for Design of the Year, Infographic, for an infographic on school segregation.